Staying power is good (about 4 hours) and its not that chalky.. 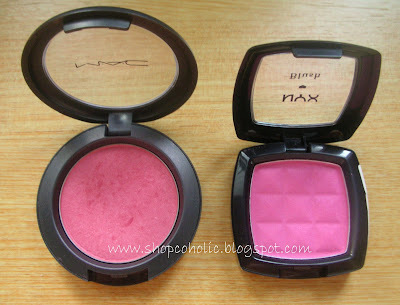 I have 2 NYX's blushes, the other one is Desert Rose. 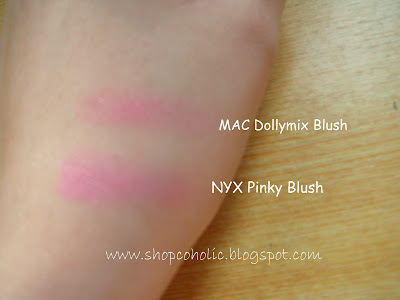 Both are really pigmented, I only need to tap my kabuki brush once or twice. I used Shy and Baby Pink, the former really looks like Dollymix so I gave it to my sister in law. Baby pink is a nice shimmery pink blush that instantly brightens my face. hey good comparison!! I really want to try philippine makeup products like the ever bilena and fanny serrano and stuff like that but i dont know where i can purchase them unless i go home over there lol.